Bugs Bunny fans, get ready! Warner Bros. Home Entertainment is dropping an all-new, feature-length animated film – Looney Tunes Rabbits Run – on August 4, 2015. The DVD will mark the first new Looney Tunes animated movie since 2006, when Bah, Humduck! A Looney Tunes Christmas was issued. 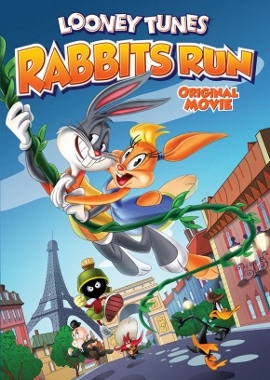 The Rabbits Run DVD will carry a $19.98 SRP. Warner Bros.’ Official Looney Tunes Rabbits Run Synopsis: “Bugs Bunny is a New York City cabbie who picks up the beautiful but bumbling perfume salesgirl, Lola Bunny, after she’s lost her job at a department store. Bugs, who drives Lola home from work in his taxi, has no idea he’s about to embark on the longest ride of his life! Looney Tunes Rabbits Run is directed by Jeff Siergey, a veteran director of the brilliant (but unfortunately too short-lived) The Looney Tunes Show (2011-2014). Longtime Looney Tunes voice actor Jeff Bergman will voice Bugs Bunny and Daffy Duck. Former Saturday Night Live cast member and current Late Night with Seth Meyers bandleader Fred Armisen voices Speedy Gonzales. Oscar-winning filmmaker Jim Rash voices Cecil Turtle. Rachel Ramras (also a The Looney Tunes Show veteran) not only voices Lola Bunny, she co-wrote the Rabbits Run screenplay with Hugh Davison.